I never thought that Spider-Man 3 would turn out to be such a divisive film. Since the first trailers started showing up, there was buzz. Huge buzz. Then, just a few days before the film's release, the critics seemed to have made it their goal to squash the bug before it became a blockbuster. A 59 million dollar opening day later (the biggest of all time), and the audiences have spoken. It was good, great at times, but not as good as Spider-Man 2. I tend to agree with them. You see, there's lots to like in this film. Love even. It's just that director Sam Raimi tried to cram way too much into an already-bloated 2 hours and 20 minutes. 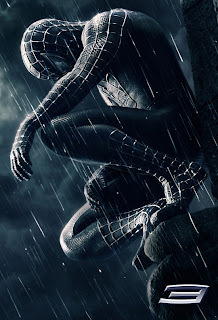 The film picks up where the second one left off, with Peter/Spidey (Tobey Maguire) and Mary Jane (Kirsten Dunst) on their way to wedded bliss, but unfortunately, Harry Osborn (James Franco) seems intent on killing Spider-Man and avenging his father. Oh, then there's this business with Peter's uncle's murderer escaping from prison and becoming transformed into a sand monster. Sounds like more than enough plot elements to put together a pretty decent blockbuster, no? Well, someone saw fit to also include a meteorite (that just so happened to crash right near Peter) that contains a symbiotic creature that attaches itself to Peter, forms a black costume, and turns him into an arrogant prick. That's the main problem I had with this movie. Why include so many plots in one film, ensuring from the get-go that not one of them will be fully developed? The black costume business was ham-fisted at best. It's already something from Spider-Man lore that's difficult to translate to the big screen, why not spend more than 45 minutes making it believable? Here's a scenario that might've worked. J. Jonah Jameson's astronaut son is landing a shuttle, but it goes out of control. Spidey saves the day, only to learn that something attached itself to the shuttle, causing mechanical problems, etc. He takes the sample to Doc Connors, some of it attaches to him, forms a costume, etc. There's your setup. Then, instead of having Spidey deal with 3 villains, you have him actually become the villain for the first half of the movie, and have the whole Venom storyline the second half. Then you could actually spend time showing Spidey abuse his new powers before they get the best of them instead of treating us to more scenes of Tobey jazz dancing. Yes. Jazz dancing. Rant over. Oh, and Sony, since I just wrote a far superior plot compared to what we ended up with, I'll be looking out for that check. I'm available for the next installment. While it may seem like I really didn't enjoy Spider-Man 3, I did. Sort of. I laughed when it was funny (Bruce Campbell is comedy gold), was on the edge of my seat during the action sequences (the best of the series), and I was pretty satisfied when it was over. But, as a fan of the character and a fan of the movies, I just couldn't wrap my head around some of the choices made. Venom, a MAJOR Spider-Man villain, deserves more than 20 minutes of screen-time. That and Topher Grace knocked the character out of the park. He, and the character, got short-changed. Also, what was with Harry's butler all of a sudden chiming in with exposition in the final act of the movie? Where the heck did he come from!? Is it a reasonably entertaining film? Absolutely. Could it have been great? Absolutely. It just seemed like Raimi was being pressured by the studio to include as much as possible in what could be his final Spidey film, and it suffers a great deal because of it. Despite my gripes, bring on number 4. I'll be there.